Each year, I prioritize the improvements I want to make to our home. 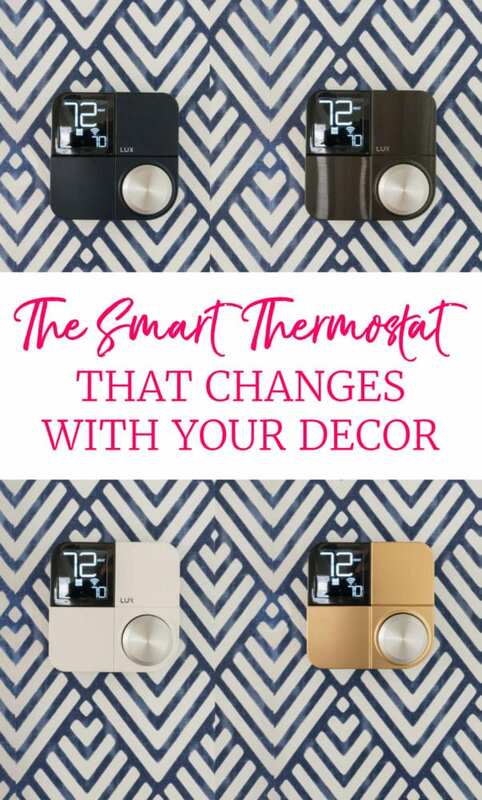 At the top of the list this year was switching to smart Alexa-compatible thermostats. I also wanted to update the short downstairs hallway, which you can see toward the bottom of this post. When the house was built, it didn’t even come with programmable thermostats, so we went BACKWARDS in function despite the house being 30+ years newer. Many days, I’d forget to manually adjust it from our preferred evening temp to daytime, wasting energy. Or we’ll head out for vacation and realize we forgot to adjust the temp to save power while we are gone. Or we’d get all cozy and tucked into bed and realize we forgot to turn the temp down and will soon feel like we are sleeping in a sweat lodge. I’d find myself getting irritated at Alexa that she couldn’t control the temp. Poor innocent robot! Technology – Must work with Alexa for voice control and our cell phones when we are away from home. Price – We needed 2 units (upstairs & downstairs) so price was a factor. 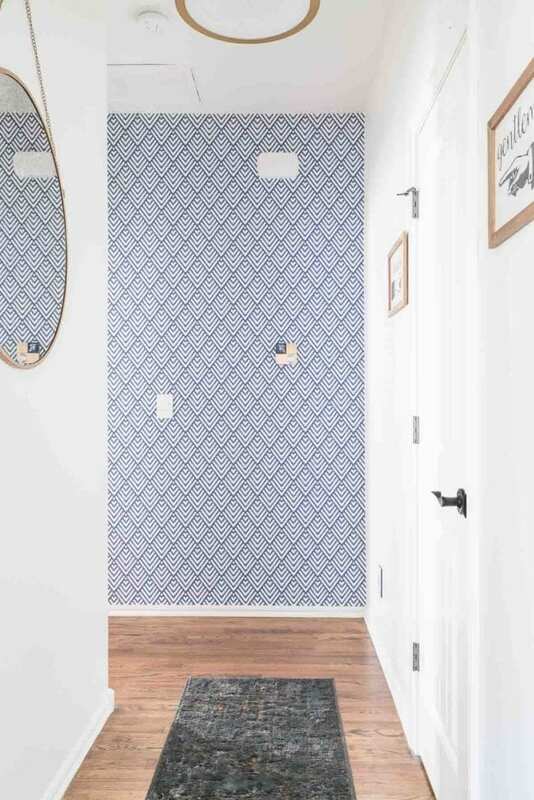 Style – With our pretty new light switches and outlets in this hallway, we wanted the thermostat to be chic as well. The Lux Kono hit all our requirements (and it also works with Apple Home Kit and Google Assistant). It exceeds my hopes for style because the face plates are interchangeable! You can get the Kono in 10 different colors if you order on their website! My favorite is the paintable version. It will be no surprise to many of you that I spray-painted mine gold! You aren’t limited to just one option either. You can order additional faceplates here. Installation is REALLY simple if your home has a Common (C-Wire) running to your thermostat already. If you don’t have a C-Wire running to your thermostat, Lux is one of the only brands that includes a power-bridge to be installed on your HVAC unit, which creates a C-Wire. For almost all of you, one of those two options will allow for simple self-installation. We had some very strange things going on with the wiring on our HVAC units, probably going back 6 years to when we moved in and found out the original installer had hooked up the upstairs HVAC to the downstairs thermostat and vice-versa. To fix that, we found out they did some workarounds and left us with a wonky situation. To be safe rather than sorry, we ended up calling a professional to unravel the mess. Since he knew what every wire was supposed to be and could wrap his head around what they had done, he was here less than an hour and had both thermostats up and running. 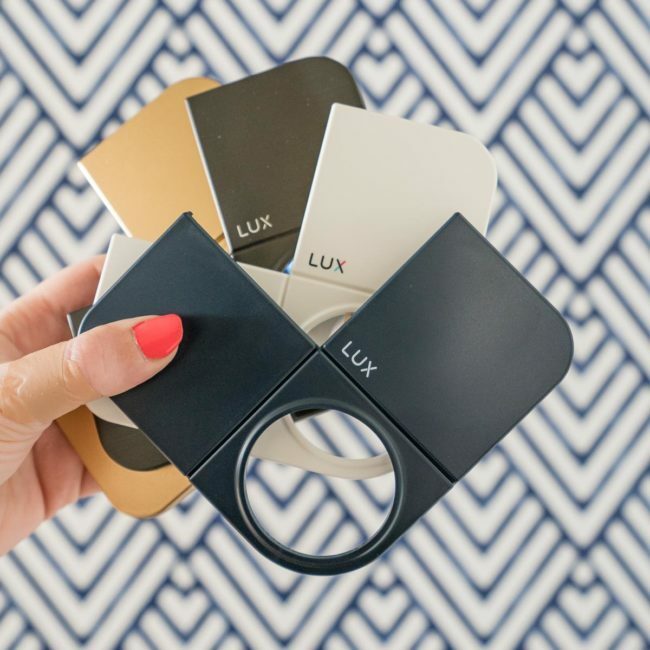 Once the thermostats were installed, we downloaded the Lux app and it walked us through the rest of the set-up process. When that was complete, we had Alexa scan for new devices and she found the thermostat right away. Before I knew it, I could ask her to adjust the temperature for us. So cool! That feature comes in handy all the time now. Since no one sleeps upstairs, we keep it cooler in the winter and warmer in the summer to reduce our energy bills. Now when we’re making dinner and decide to play pool afterward, we can give Alexa a heads up. She can adjust the Lux Kono while we’re eating and we don’t walk into a hot or cold room (depending on the season). 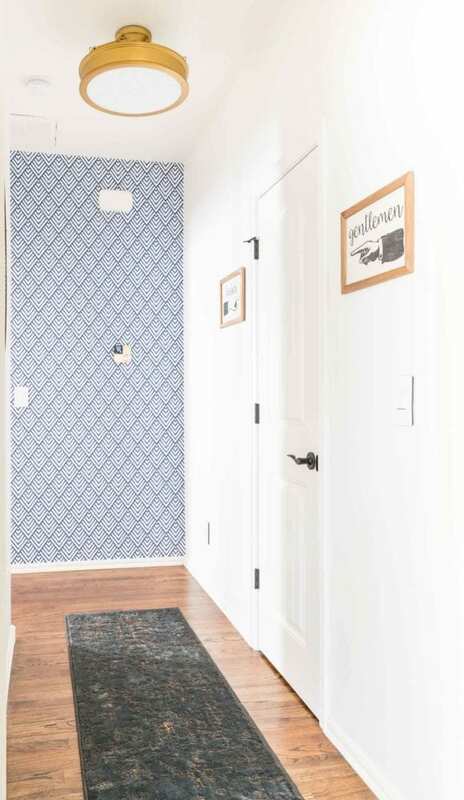 The prettier thermostat motivated me to makeover the short hallway leading to our bedroom, which had been on my to do list for way too long. The white box in the middle of the back wall was the boring old thermostat. You may have also noticed the abundance of other functional, but ugly, items cluttering that back wall and ceiling. It was a pretty small spot to have an HVAC return, doorbell chime, smoke detector, thermostat, light switch, and that ugly light fixture. You hardly notice any of that mess now! White paint on the walls and ceiling make the hall look wider and brighter. Even better, they make the HVAC return and smoke detector almost disappear instead of sticking out like they did before! For the back wall, we found a peel and stick wallpaper. I’m going to share more feedback about that later in a separate post. To complete the transformation, we added a round mirror and light fixture for a bit of softness. I’ve had that light fixture pinned for a couple of years and I love it just as much as I hoped! On the right side of the hall, I kept the vintage-look signs pointing out the powder room. They’re about the only thing that remained from the before photo! Here’s a look at the before and after side by side. I think we exceeded our ever-present goal of adding style AND function! As much as I’m obsessed with how this space looks now, the Lux Kono really is the new star of the space. It looks amazing, but more importantly has improved the function and comfort of our whole house! 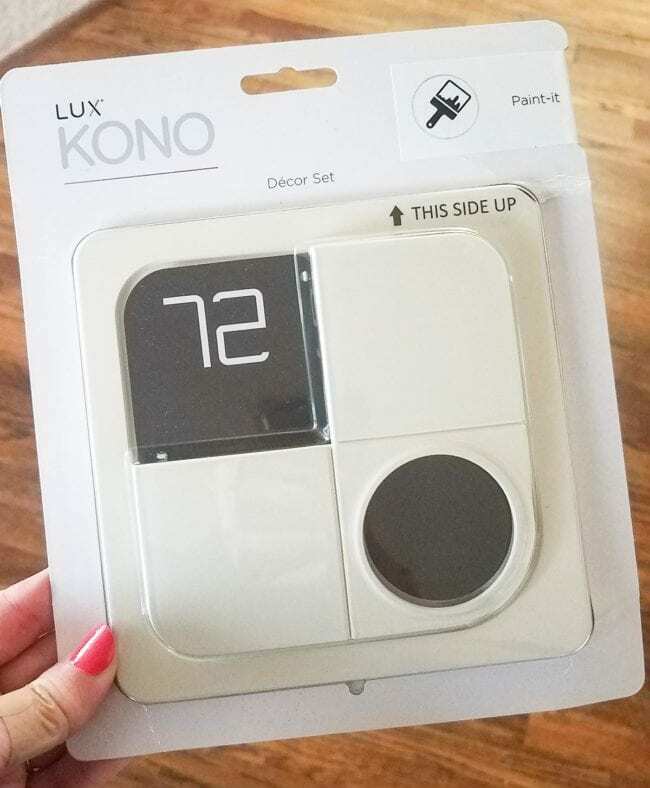 Here’s an image to pin so you’ll remember the model when it’s time to upgrade your thermostat! « 5 Ways to Use One Small Vase – Fast Friday! The “new” hallway is amazing!! You would not even know it looked like that before!! You are the MASTER of makeovers!! 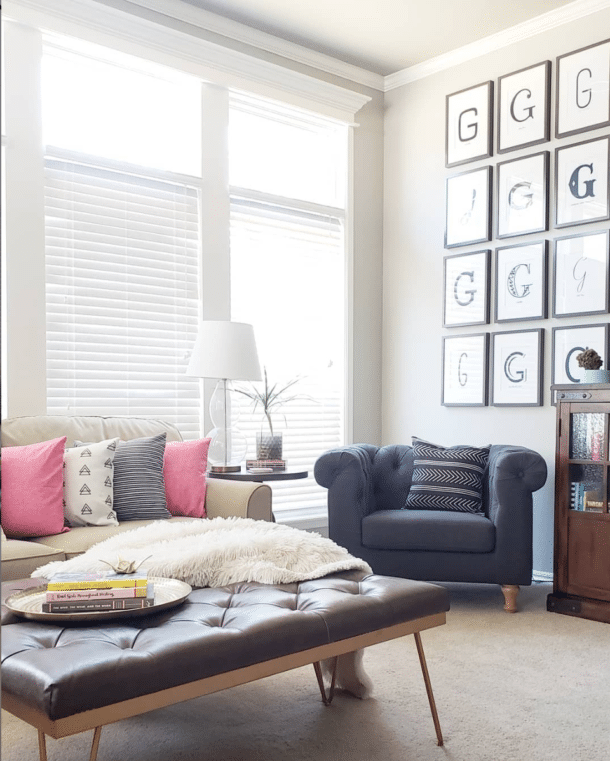 It flows with the decor in the rest of your home….well done!! And, aren’t programmable thermostats the best thing since sliced bread?? We use ours all the time!! They are a huge money saver over time as well. Enjoy !! Thanks Sarah! Isn’t it crazy how it looks like it’s in a different house? And even better, like it’s OUR house! We love it! 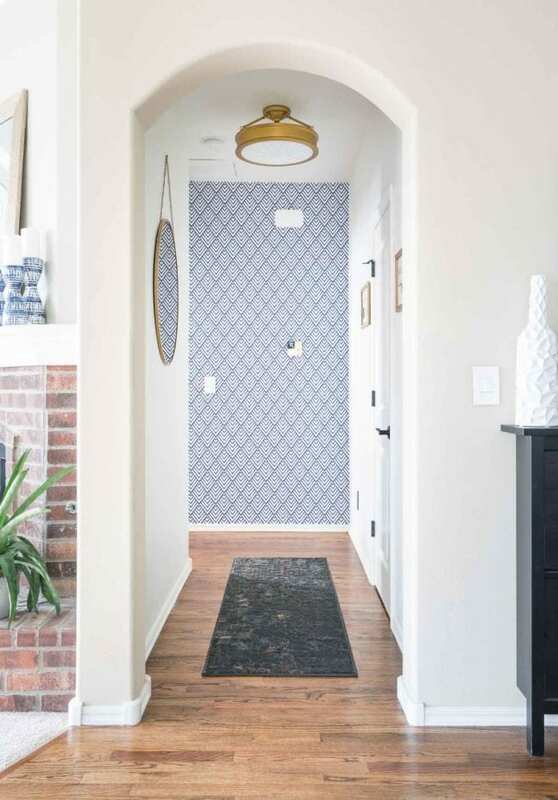 I love how bright and airy your hallway looks and you still included colour! 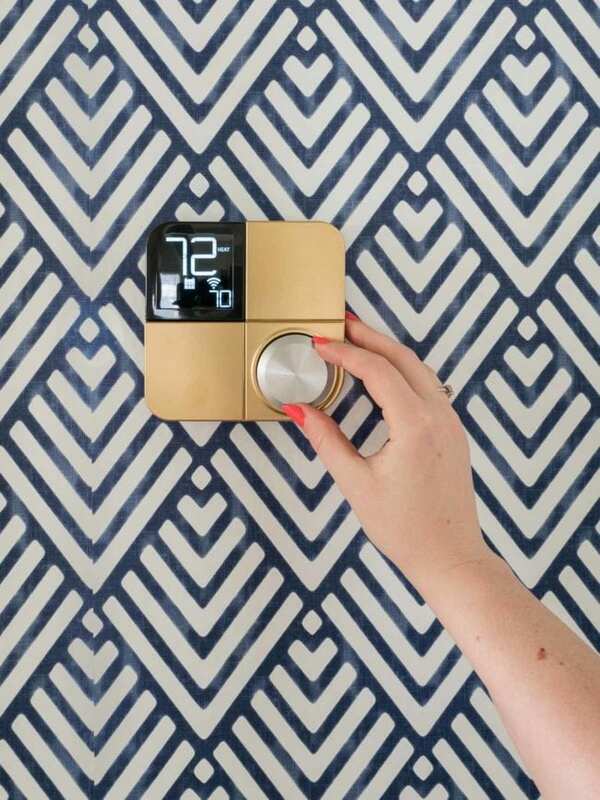 The thermostat is very cool! I’ll have to keep it in mind! Thank you! I always love the balance between bright white and color so I’m glad it worked here! And you’d love that thermostat. 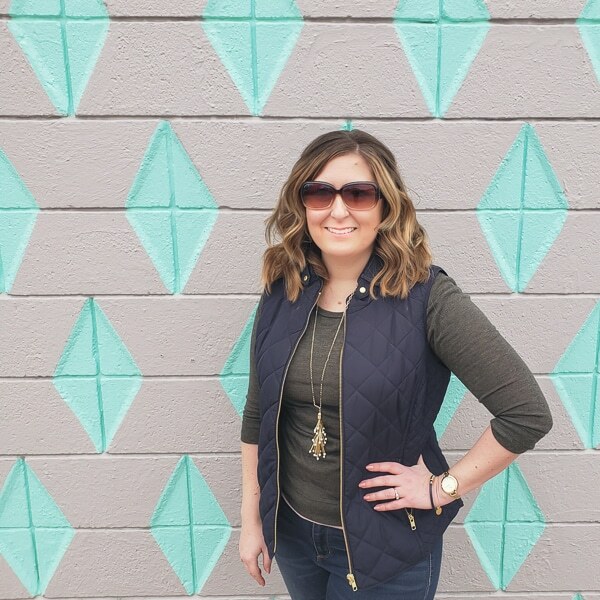 Your hallway looks amazing Melissa! I love how you can change the thermostat cover, and it’s actually really nice looking. 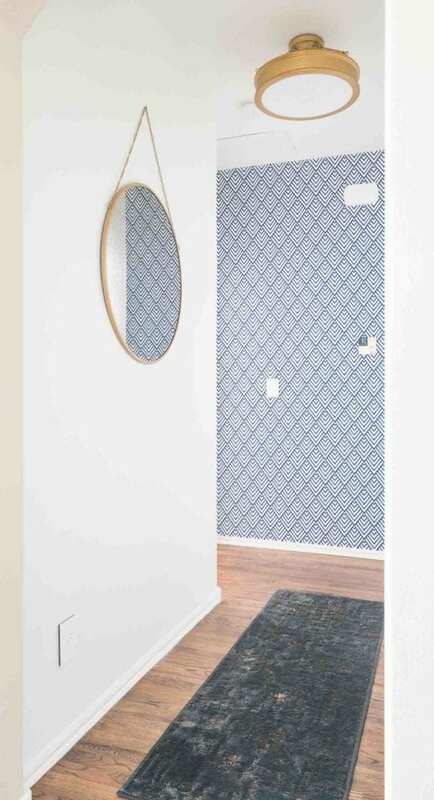 Also that wallpaper is a complete game changer for this space! So pretty! Wow Melissa! It looks amazing! It looks like a different home. I love paint and paint chips. It was an obsession! My house had White Dove on all the mouldings but I’m impressed on how great ot looks on your your walls . We downsized and live in an apartment now so I’m looking forward to your post on the wallpaper! I was a little scared to put it on the walls, but we used it on the diagonal accent wall in the bedroom too. Now I’m about ready to expand it to the whole entry hall & stairwell! 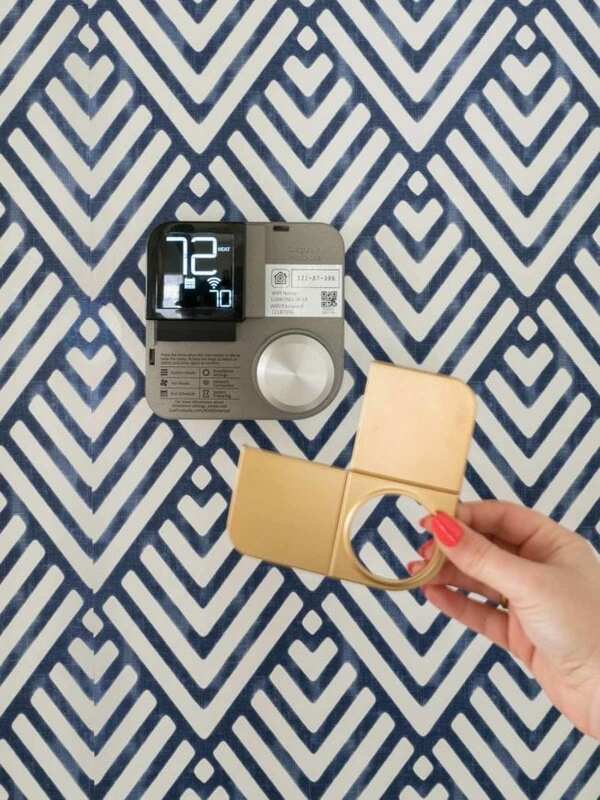 Can’t wait to share the details on what worked and what didn’t with the wallpaper! I love the updated hallway. It is stunning. Not a fan of the new thermostat but we are still a bit old school. Thank you for sharing though. Now I have the info if qe ever start down that road. Thanks Audrey! You might already have this feature, but just being able to schedule it to auto-adjust the temp each night to cool down around 9:30 for sleeping and then warm back up in the morning automatically in the morning has been delightful. I’ll never understand how the old one was bulkier and did nothing other than manual adjustments. But I understand the appreciation of old-school simple things too! Love love love! And thanks so much for the first part of your email about being able to slip into a snapshot of your life. It really hit home with me and I’m re-evaluating parts of my life. Baby steps, but steps forward none the less. Yay! I’m so glad that part was helpful. And the older I get, the more I realize how powerful baby steps are…I feel like they’re often more effective than trying to make huge changes all at once. Wow it looks incredible! 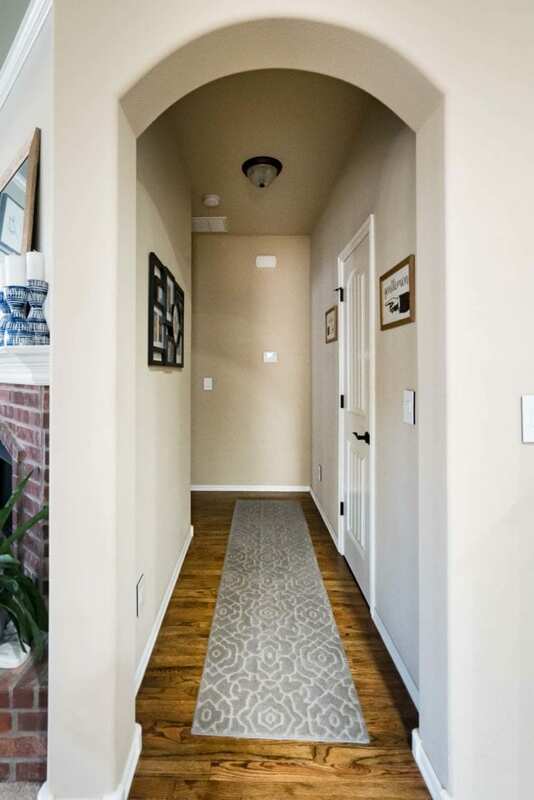 Haha, never thought I would swoon over a hallway!